On this spring Justice Ride, I became a pseudo-celebrity when I made the cover photo of the University of Florida newspaper story on Created Equal’s outreach on campus. Some of the other riders had me sign their copies. But there was something much more important about the photo. The picture is of me shaking hands with Alfredo, a senior at Florida, after conversing with him about abortion’s morality for probably half an hour. But two others were pictured in the photo. One of them was Marla Cardamone, a teenager who was pressured by a social worker to have an abortion. Marla died of septicemia after abortionist Michael Weinberger erred in administering an injection in his Pittsburgh abortion facility. The other is of a 5-month fetus who was dismembered in a dilation and evacuation abortion, which involves grabbing the limbs, twisting to break them off, and pulling them out. The head is crushed and pulled out last. Before the fetus bleeds to death, she feels every bit of the pain of dismemberment at this stage. Marla nor this baby were able to sign that photo. Their lives were taken prematurely by abortion. I made this clear on the bus after our second day at the University of Florida. “Yeah, it’s cool that I’m on the cover photo. But what’s much more important, and what will be remembered much more than me, is that the victims are in that photo, and everyone that reads the article is going to see that,” I said. The interesting thing was, I wasn’t supposed to be on this Justice Ride. 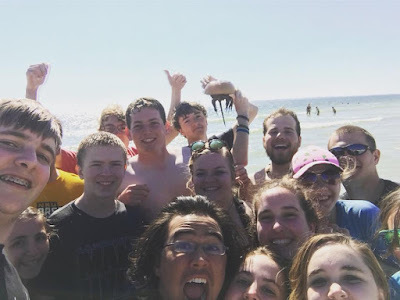 Two spring breaks ago, when I was a junior at NKU, I made the decision to go to Beach Reach after spending my first two spring breaks on the Justice Ride, a decision I don’t at all regret. Beach Reach had a profound impact on me and my ability to share the gospel. That summer, I went on two trips with Created Equal, but the next spring break I again went on Beach Reach, then worked all the next summer and did not go on any mission trips. 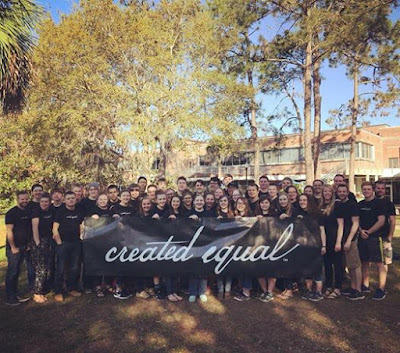 So, even though this was my ninth mission trip with Created Equal and sixth Justice Ride, I had not done anything with the organization since July of 2016. This was largely due to my schedule. My senior year of college, I worked or had class at least five days a week, sometimes six or seven. Then in the summer I worked about three days a week and was frequently out of town because of work. Some of this was also due to my disenchantment with the pro-life movement stemming from the 2016 presidential election, when I took a strong stance against voting for Donald Trump even in the general election. So, between these two things, I wasn’t sure if I would be involved in any future pro-life work. My goal was to get a group together to go to Beach Reach on my spring break, but that fell through. The door opened for the Justice Ride, and I saw God in the works. But I had no idea how this would go. I am so grateful that things worked out as they did. This was the most comfortable I have ever been in outreach, the boldest I have been, and there were some great mentorship opportunities as one of the oldest and most experienced team members. I loved to see the passion coming from 14- and 15-year-olds, who had the ability to debate philosophy majors. One thing I learned was to trust the process. Created Equal does not demand perfection of its volunteers. For many of the students, this was their first time doing this sort of outreach. They were trained, and then they were put in the field. There were times when I heard them in discussions and I wanted to jump in their conversation. But I remember my first Justice Ride. It took time, experience, and further training through the summer internship to get where I am. They’ll learn and grow as I did. I also had a personal emphasis on trying to look very relaxed and comfortable to make myself more approachable, since I do not naturally look the most approachable. I was able to put this into practice throughout the week. But the most memorable conversation came by accident. At the University of North Florida, two girls came in with a portable speaker, maybe just passing by, or maybe to drown out the open mic that was taking place. A number of our team members tried to talk to them, but they had no interest. Eventually, the police made them leave since they didn’t have a permit. I had recognized their music, so I mentioned it to them as they walked by and had a quick laugh. I just wanted to be personable; just because we disagree doesn’t mean we have to be rude. They kept walking. But then they came back. Doors are opened in weird ways. They asked about birth control, which actually helped illustrate my point of human equality. If birth control is an abortifacient, it prevents a new life from implanting in the uterine wall. Those types of birth control kill human beings. “I like that term, ‘human equality,’ that’s a good way to put your argument,” one replied. I found out one of them is actually from Ohio. We talked about our college majors. Then they posed the question I was eventually expecting. This also helped me illustrate why I believe abortion should be illegal. It was a good reminder that, while we may ask 75 people a day what they think about abortion, they don’t see that every day. We have to remember we’re not discussing this with hypotheticals. 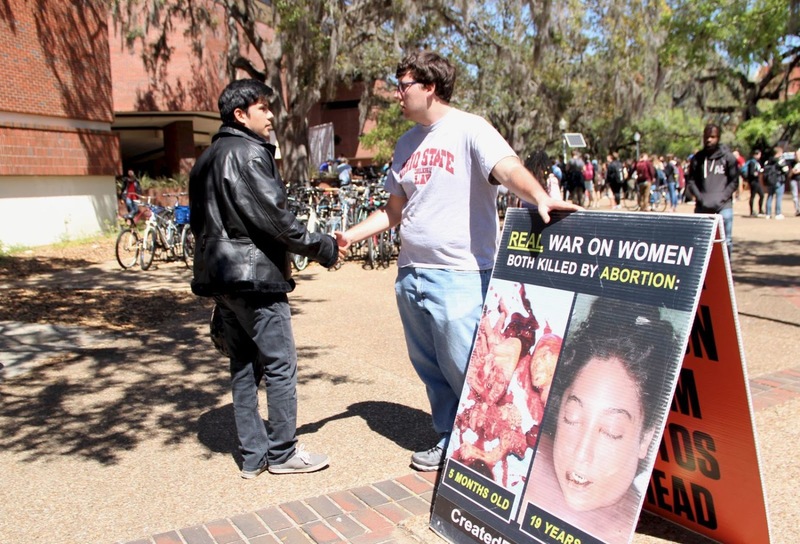 We’re discussing abortion with people, with their own experiences and values that lead them to believe what they do. And these girls had a legitimate care for women in difficult circumstances, just as I do. We had different solutions, and we could discuss that calmly. When I was talking to Alfredo the next day, a pro-choice person across the square began yelling at one of our team members. “I don’t get why people are getting upset. We can discuss this calmly, just like you and I are,” he said. It wasn’t always easy to have this attitude. After a great day at Florida, my last conversation was with a pompous student who brought in so many red herrings that I couldn’t get a word in. 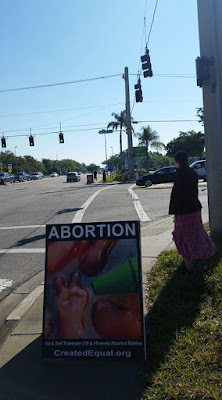 He threw his education in my face, not knowing that I am more educated than him, and not caring that education in no way makes someone a greater authority on morality or abortion. I was left angry, and asked myself why I put myself in the position to be treated that way. We get cussed out, yelled at, flipped off, and occasionally physically attacked. We are the most hated people on campus. We attract protestors. A 14-year-old got inserted into a hypothetical of being raped and impregnated (which is when my friend Silas stepped in and said, “You can talk to me that way, but you will not talk to her that way”). I have never been more mistreated than when I am with Created Equal. Then I took a look at our signs. My mistreatment is usually verbal. My most serious Justice Ride injury was when my friend Joe lacerated my nose accidentally. But the babies—those fellow human beings—they are being ripped apart every day. My persecution is nothing in light of what they face, and unlike me, they are completely helpless. My persecution is also nothing in comparison to the King of My Heart, who died to give me life. My passion is renewed. There is nothing I would rather devote my life to. The psalm doesn’t sugar-coat. There are times of great trials in the life of the Christian, whether by circumstances that God uses to grow us, or through persecution. We only know a sliver of what that can entail, as we can read accounts of thousands who have given their lives for the cause of Jesus and know that we are not (currently) faced with that. Even in America, though, we have seen people lose their businesses because they followed God’s commands over the world’s demands (and because, I supposed, there aren’t any other places to order wedding cakes and flowers). That Tuesday night I made a vow. It doesn’t matter what persecution I face. If it costs me career opportunities, that is my cross to bear. If I am derided, that is my cross to bear. If I am abandoned by friends, that is my cross to bear. Why? 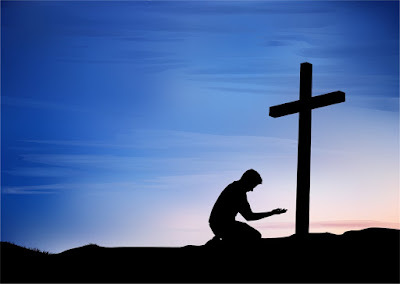 Because Jesus bore His cross all the way to Calvary, and then He was nailed to it and lifted up in humiliation and anguish to pay for my sin and purchase me back from the chains of it. He gave everything, suffering the worst kind of persecution. When I consider being yelled at by a homosexual classmate because of my beliefs about homosexuality, or being ridiculed and threatened for advocating against abortion, or being considered radical for ordering my life around an ancient Book, it all seems as nothing in light of the crucifixion, and I have a great peace that comes over me in the face of such situations. God is with me. Even if it is not reciprocated, I can still show love to these individuals, because God’s love has taught me how to love—unconditionally. Those are truly happy, who go forth, and go on in the exercise of religion, in the strength of the grace of Jesus Christ, from whom all our sufficiency is. 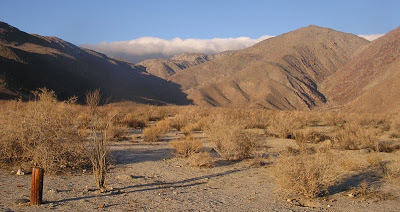 The pilgrims to the heavenly city may have to pass through many a valley of weeping, and many a thirsty desert; but wells of salvation shall be opened for them, and consolations sent for their support. Those that press forward in their Christian course, shall find God add grace to their graces. I don’t want to capitulate and join the ranks encamped in the tents of wickedness. It might be an easier and more popular lifestyle, but it is not for a child of God. I would rather be a doorkeeper in God’s house. I would rather have a lowly position in God’s will than a mighty one outside it. 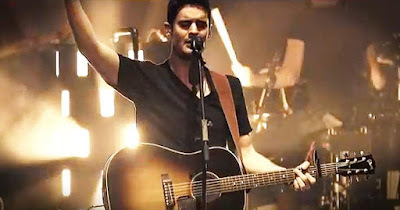 Kristian Stanfill performing "My Heart is Yours"
I lay down my life. And all to Jesus I surrender. All to You I freely give. In Your presence I will live. Just the music alone would bring tears to your eyes. The message is one of total surrender to God. When we surrender to something or someone, we can’t surrender to anything else. That is inherent in surrender. “Whatever the cost,” we choose to follow Him. Surrender is complete. It requires surrendering our passions, our talents, our fears, our finances, our relationships, our ambition, our needs, our desires, our sin, our everything. That may mean missed opportunities. That may mean derision. That may mean lost relationships. That may mean for me one day choosing between a certain position or following Christ. It may mean me losing a job because of what I believe. What will the choice be? Are we willing to accept the consequences of this life-changing decision? As for me, I abandon my ambition at the foot of the cross.